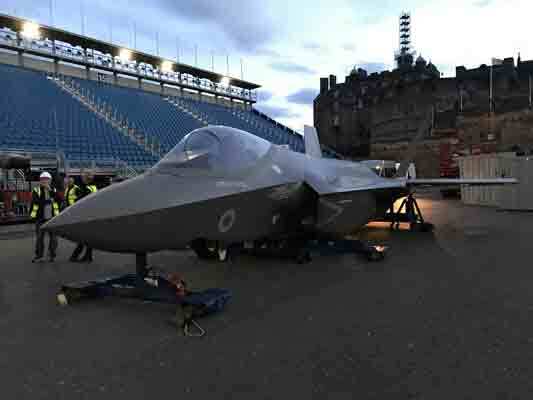 Four Modulift spreader beams were used to suspend a full scale, 10t model of an F35 Lightning II jet fighter, which was hung at the entrance to Edinburgh Castle's esplanade at this year’s Royal Edinburgh Military Tattoo (REMT). The 50t capacity Liebherr LTM1050-3.1 in the foreground and the 20t capacity Kato CR200Ri behind. 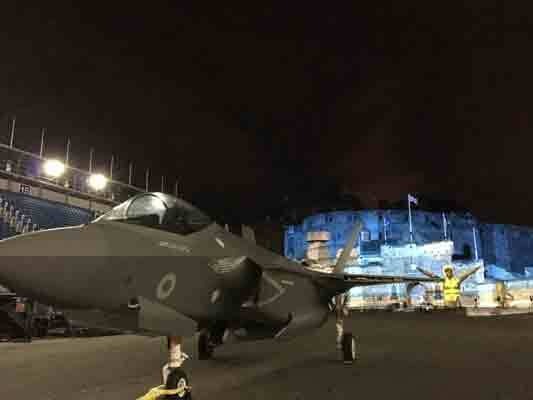 The F35 featured alongside a Lynx Mk III helicopter and a CGI projection onto the castle walls of an aircraft taking off from the deck. The annual celebration of music and entertainment took place this year from 4-26 August. 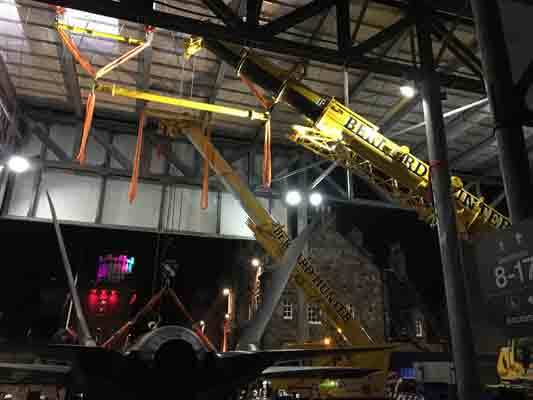 Edinburgh-based rental firm Bernard Hunter Mobile Cranes received a scope of work from construction company Interserve, which was given the task by REMT organisers of positioning the replica jet underneath the Tattoo stand structure. Integral to the suspension phase of the project were four Modulift spreader beams—three MOD 24s and a MOD 50—sourced from Bernard Hunter’s below-the-hook equipment stock. 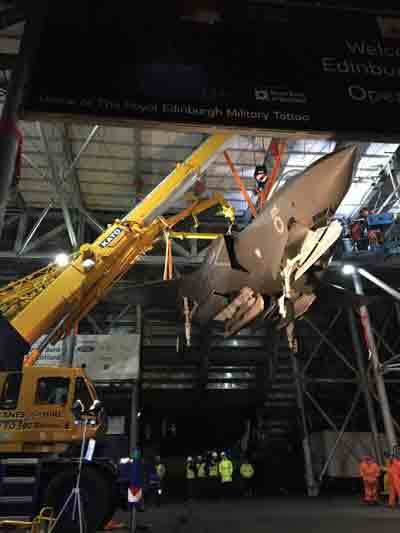 The F35 was lifted from ground level, directly upwards to its final position. The MOD 24 offers 24t capacity at 5m / 17 ft. and lower capacities up to 8m / 26 ft., while the MOD 50 provides 50t capacity at 8m / 26 ft. and lower capacities up to 13m / 42 ft. The beams were configured so the largest was beneath two smaller ones above the back of the plane that were rigged into the ceiling, and the final MOD 24 suspended the front of the plane. Nylon slings were each rated at 10t working load limit. The beams were configured so the largest was beneath two smaller ones above the back of the plane. Rafferty explained that with only two weeks between receiving the contract and the lift taking place, it was important to gather as much information as possible to facilitate lift planning, with height restrictions associated with working underneath the stand the primary focus. He said: “We were working with only millimetres to spare above the cranes.” Various on-site meetings took place with Interserve and two engineering firms, Arup Engineering and George Brown Engineering. Arup provided important details about the roof structure, which was erected especially for the REMT. Upon further consultation with Lockheed Martin, the manufacturer of the F35 model, the spreader beam concept was devised. Bernard Hunter chairman, Jim Rafferty, conducted lift plans and oversaw execution of the project. He combined with a total of six Bernard Hunter personnel over 12 hours, from 6pm to 6am the following morning. Once the plane was suspended, George Brown Engineering completed tests on the rigging equipment; with safety of paramount importance it continued to test the rig throughout the event to ensure it remained safe for people to walk underneath. 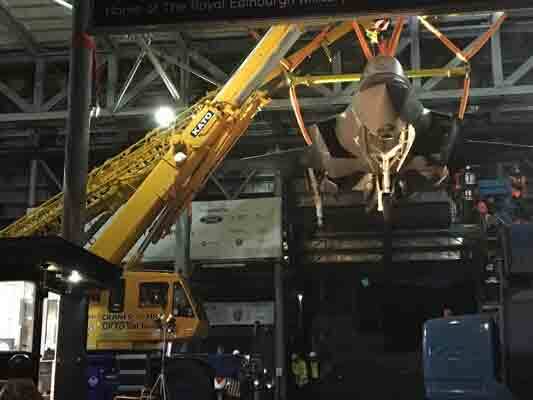 The team returned at the end of the month to detach and lower the plane using the same lifting equipment. Bernard Hunter boasts a fleet of nearly 30 cranes ranging in capacity up to 500t. Spierings mobile tower cranes, Kato city cranes, Maeda mini-cranes and Palfinger loader cranes are employed on a variety of projects in the city and further afield. In addition to the beams utilised for the F35 suspension, Bernard Hunter also stocks two MOD 12s. The full scale, 10t model of an F35 Lightning II jet fighter.